Upon arrival at Cancun, you will get a warm reception from one of our representative at the airport. He will help you to get transferred to the already booked hotel. Complete the formalities and enjoy rest of the day at leisure. For decades Cancun was a deserted island located in the forgotten region of the Caribbean is now emerges as the hottest tourist destination in Mexico where one can enjoy one of the most cherished holidays of their life with their family and loved ones. On the second day of Cancun Tour Package post breakfast, you will be picked up early in the morning to drive towards the southeast of the city of Merida to witness the ruins of ancient Mayan city at Chichen Itza Archaeological Park which is around 120 Km from it. This sacred site is one of the greatest Mayan Centres of Yucatan Peninsula. It represents a fusion of Mayan construction technique along with new elements from central Mexico which makes it one of the hottest spots to visit and witness the Mayan-Toltec civilizations. It is now a UNESCO World Heritage site where visitors can explore the main buildings, the pyramid of Kukulkan the largest and most important ceremonial building, walk over the “Sac beh” or the white path used for the ceremonial purposes to reach the Sacred Cenote, a natural well 60 meter in diameter, the Temple of Thousand Columns, the Observatory, the Ball Court, Nunnery and the other important buildings. You can even enjoy the delicious Yucatecan food over here. After spending the whole day exploring the ancient Mayan ruins return back to the hotel for dinner and overnight stay. Next morning after relishing delicious breakfast proceed to explore the major attractions of the city. The city is a home to 14 pristine miles of white sandy beaches where you can indulge in beach site activities. The city is a home to three largest underwater cave systems and they all are in Riviera Maya area where lots of adventurous activities are just waiting for you. Visit the Maya Museum, the Cancun National Marine Park, visit the Scenic Tower, Urbano Kabah Park etc. Return back to the hotel for dinner and overnight stay. After morning breakfast check out from the hotel for the return journey. With this, the fun-filled and adventurous holiday package to Cancun comes to an end. 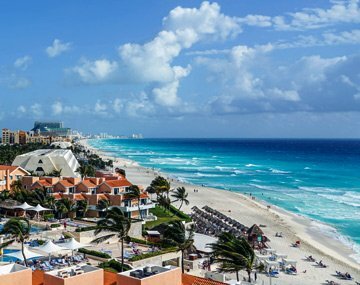 If you are looking for a perfect holiday destination that provides you ample of opportunities for enjoyment, do coolest activities, indulge in adventure, enjoy pumping nightlife, provide limitless accommodation options and taste the most desirable lip-smacking delicacies, then Cancun a small city in Mexico is surely your next destination. So what you are waiting for? Book Cancun Mexico Tour Packages now and enjoy a dream vacation for your family and loved ones. BookOtrip is your reliable travel partner that helps you to realize your travel dreams by visiting the desired destinations around the world. We offer great deals on flight tickets, car rentals, accommodations to the most luxurious to budget hotels so that you can comfortably enjoy your journeys. With us you are assured and enjoy the most amazing holiday experience. Thanks a lot BookOtrip... The Cancun trip was a new chapter to the book of my experiences. If you are a person who loves to indulge the culture, you shouldn't miss the trip to Cancun, especially the Chichen Itza Archaeological Park.